Last year, I shared the importance of taking conversations offline to grow your business and suggested some great events to help make that happen in 2012. Hopefully you were able to make it to at least one, but either way this year is looking even better for in-person events that will help you step outside of the blogs and get social to better your digital strategy. 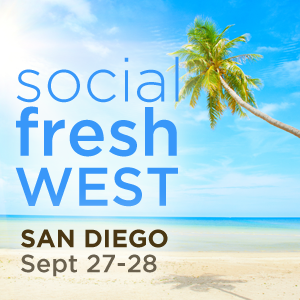 Due to popular demand, Social Fresh Conference is back in San Diego this year. A more intimate setting of around 400 attendees and (intentionally) not growing, this conference is known for great networking opportunities in addition to desireable big brand experience. With communications representatives from companies like Southwest Airlines, Machinima, the Chicago White Sox, and Billboard, it’s an amazing opportunity to see what social relations looks like in a large-scale, high-profile setting. It’s also much more fast-paced as speakers only have 30 minutes with their audience, encouraging a direct hit on the key takeaways that you’re looking for. Learn more about Social Fresh Conference on their website. Another hot one in Ohio! Content Marketing World is in its third year in the buckeye state getting back to its roots in Cleveland later this year. The name really says it all because it’s the place to be if you want to learn from the best in content marketing strategy. Jay will be opening the conference with a keynote stressing the importance of helpful marketing rather than over-selling and he is followed by more A-list teachers like Brian Clark, Ann Handley, Lee Odden and Jeff Rohrs. For a serious deep dive with top-notch talent in content creation, this is a can’t miss event. Read more about their agenda and lineup for this September on their website. Social Brand Forum is an intimate event in Iowa’s Creative Corridors to bring all size organizations together to learn, brainstorm and network with social media marketing leaders. After its first ever event, Social Fresh named it a Top 10 Social Media Conference last year. Similar to Ohio Growth Summit, this event is very accessible in both price point and content for brands who are trying to familiarize themselves more with digital media and how it can be used as a marketing vehicle. Familiar names pop up here such as Jay, Gini and Lee but also Jason Falls, Marcus Sheridan and DJ Waldow. Nick Westergaard of Brand Driven Digital is heading up this event in its second year and you can learn more about it on the company’s website. What events are you planning on that I left out? Share them in the comments.